The Offset Pressman: What Is Heatset Printing? 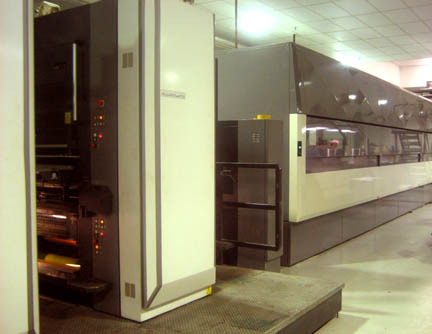 Heatset printing is simply a term to describe an offset printing process. Web presses can be either coldest or heatset, and heatset describes the drying process used. Interestingly heatset should not be mistaken for heat dried printing because in essence the ink does not dry, instead it sets. While some sites provide a very basic description, I will endeavor to give a little more detail on the level that a pressman would. Heatset printing also differs from more commonly known forms of printing. For example, a bubble jet printer works by spraying ink onto paper. The ink absorbs into the paper and the water based ink will evaporate leaving a dried pigment on the paper. It behaves in a similar way to coldset printing. Heatset printing works differently. A layer of ink is applied to a usually glossy paper that does not allow the ink to absorb into the paper. The ink is not water based, but oil based meaning that it must literally boil off the paper to dry. Heatset ink consists of varnishes or solvents which make up the oil based portion of the ink. Pigments are used for color. In addition, various resins and waxes are added. Ink companies will also put in various additives to meet the demands of the printing process and customer requirements. After being printed, printed paper enters the heatset oven. Then oil based solvents will reach what the pressman calls a flashpoint, or evaporation point. What is left over are waxes, resins and pigment. Then the paper will pass through to chilling rollers. When the waxes and resins cool down, they solidify or set, hence the designation heatset printing. Heatset presses will also add a silicone applicator following the chilling units. Since the ink is still not 100 percent dry, a layer of silicone will prevent the ink from smearing or offsetting onto other parts of the press during the folding process. In addition, some presses will have a add more moisture to the paper since so much was lost in the press oven. While this article discusses the heatset printing process, understanding the difference can help when choosing the quality of web printing desired.